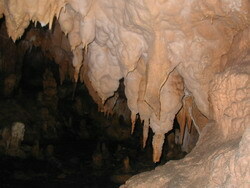 Wallingford Caves - A world away in Jamaica's interior. Do you dare to discover? Let me plainly state that Wallingford Caves in St. Elizabeth are not a tourist attraction. But they are exciting, and slightly defiant, giving the impression that they really don't want you bothering them. To enjoy these caves you need to love nature, not be afraid to get a bit dirty, be willing to break a sweat, and get wet if you need to. And I almost forgot - you also need to be fairly fit, because they're not easily accessible. So I won't hold it against you if you content yourself with reading about them, since they do make interesting reading. But if you do want a remote sort of nature adventure, by all means give them a try. They are just outside the town of Balaclava, which is about an hour away from Black River. You really should contact the owners before venturing onto private property, so once you get to Balaclava, ask for the McFarlane's to get permission to visit. The river gets really aggressive during the rainy season. My first visit to Wallingford Caves was on a fine day in April. Mrs. Maxine McFarlane, was our trusty tour guide. We visited three caves. The first, I'll call the "river cave", as the One Eye River runs through it. We parked the car on the main road and trekked on a downhill path for a few minutes through the bush, which wasn't too tall as it was the dry season. (I guess I should try to be exotic and say "jungle" instead of "bush", but I'm a plain-speaking person!). At the entrance to the cave the water was ankle deep in places. We managed to jump over those spots and get inside the cave with our sneakers barely wet. This cave is the longest river cave in Jamaica, but unless you're a serious caver with proper dive equipment and lighting, you can't go very far. But even close to the entrance it's beautiful, not to mention peacefully creepy in a way that only a cave can manage to be. During the dry season the river is low, allowing you to sit on the smooth rocks and and dip your feet in the water, while the stalactites, stalagmites and bats watch you. In the wet season, the river exerts its influence, so Stay Out! The "hill cave" was the second of the Wallingford Caves on our agenda. This was the most challenging one for me, as I don't get much practice climbing near-vertical hillsides everyday. Adrenalin rush! This is a dry cave with lots of interesting rock formations, but it was sad to see graffiti on the walls. Maxine told me that children go there on school trips (often without permisssion), leaving behind food debris and graffiti. The debris is causing the cave's ecosystem to deteriorate, and not much life remains inside. I enjoyed it nevertheless, and had a lot of fun getting back down the hill. It involved a fair number of prayers, and getting the seat of my pants somewhat frayed. I guess it can't have been all that scary, as a 9 year-old made the climb and lived to talk about it. My favourite of the three Wallingford Caves is the one Maxine calls the "crawl cave". She calls it that because you have to crawl to get inside, and keep crawling for a short distance before you can stand. Let me try and say this delicately - if you're big bodied, you'll get stuck. It's worth the crawl - there are sparkly stalactites, shapely columns and swirls of sediment on the floor of this small cave. 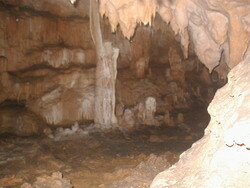 With Jamaica's rocks being mainly limestone, there are caves all over the island. 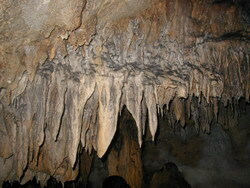 There are definitely more famous and conveniently located caves in Jamaica. 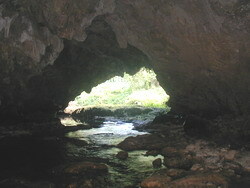 Green Grotto in St. Ann is legendary, and is a well established tourist attraction. If you do decide to visit the more uncharted caves of Jamaica, bear in mind that you are responsible for your own safety. The proper gear is a must - shoes with a good grip, reliable flashlights, machete in case you need to cope with bush. Gloves and maybe a hard hat might not be a bad idea either. Wallingford Caves in St. Elizabeth are for the special adventurer who understands that nature doesn't always come neatly packaged. That bush is sometimes just plain bush.